HOBOKEN, N.J. – Vine, the upscale rental building located at 900 Monroe Street on Hoboken’s burgeoning western edge, is almost fully leased, according to developers Bijou Properties and Intercontinental Real Estate Corporation. Over 90% of the 135 luxury residences at the 11-story building have been reserved in the first nine months since opening The high level of leasing velocity at Vine gives credence to the appeal and market acceptance of this emerging neighborhood setting, which offers luxurious homes, first-class amenities and an ultra-convenient location steps from the 9th Street Hudson Bergen Light Rail Station. 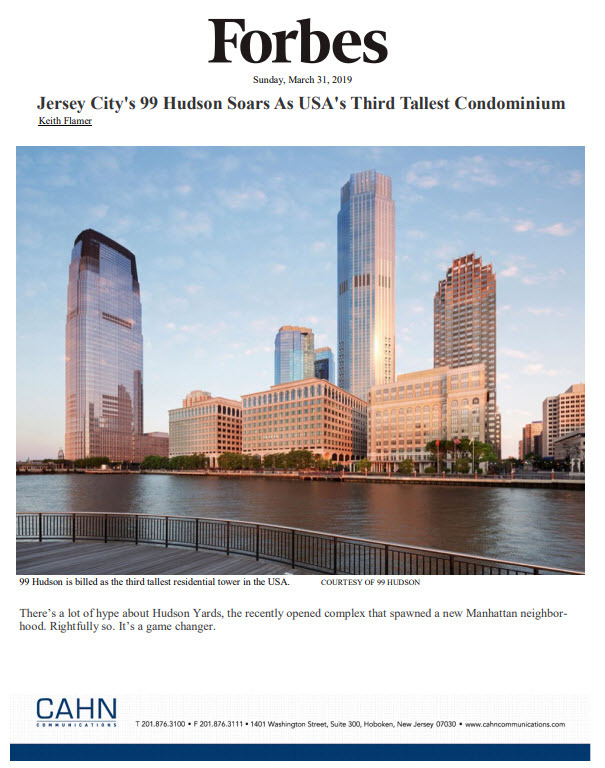 The Marketing Directors, the building’s exclusive marketing and leasing agent, conceived and executed a comprehensive program that from the onset successfully reached the target market and positioned Vine as the signature new rental building in Hoboken. A limited inventory of one-, two- and three-bedroom homes are available at Vine, with net-effective monthly rents currently starting at $3,115. Apartments boast a number of designer and energy-efficient features, including sustainable bamboo flooring, oversized windows, kitchens and baths with modern fixtures, Frigidaire and Bosch Energy Star appliances, granite countertops and modern cabinetry. Lavish baths with porcelain tile are also a staple at Vine. Residences are available for immediate occupancy. Complementing the homes at Vine is an amenity-package that appeals to the active professional lifestyle. Outdoor amenities include a pool and outdoor deck with individual barbeque stations, separate outdoor lounge areas, poolside sunbeds and lush landscaping. Inside residents can enjoy a clubroom, fitness center and bike storage. Vine offers residents a free shuttle service to the nearby Hoboken PATH station, as well. Conveniently located at 900 Monroe Street, steps from the 9th Street Light Rail Station, Vine blends an upscale living experience with the convenience of quick access throughout New Jersey’s Hudson River “Gold Coast,” including Hoboken’s PATH, New Jersey Transit and Ferry terminals with service to Manhattan. Vine features 13,500 square feet of street-level retail space, occupied in part by a Daycare Center. There’s also an onsite automated parking facility. A 7,000 square-foot public park adjacent to the building built by the developers is also available to residents. Vine has been built in accordance with the U.S. Green Building Council’s (USGBC) standards for LEED ® certification. Vine will be the fourth LEED-certified building introduced by Bijou Properties in the City. For additional information on Vine, please visit www.vinehoboken.com or call 201-386-VINE (8463). The Marketing Directors’ onsite Leasing Office is located at 900 Monroe Street, Hoboken, NJ 07030. Intercontinental Real Estate Corporation is an SEC Registered Investment Adviser with decades long experience in real estate investment, finance, development, construction management and asset management. Since 1959, Intercontinental has managed, developed, or owned over $10 billion in real estate property. Today, Intercontinental manages a portfolio in excess of $4 billion for its clients. The Intercontinental portfolio is diversified both by robust property mix and by geography. Fund strategies actively seek opportunities to invest in both Core and Core-Plus properties, as well as in Value-Add operating properties and development projects. Founded in 1999 in Hoboken NJ, Bijou Properties designs, develops & manages the highest quality sustainable buildings and has become a recognized leader in the field of green development along the Hudson Waterfront. Recent projects include Park + Garden, Garden Street Lofts (NJ’s First LEED Gold Residential Highrise), The Hostess Factory, a 42,000 square-foot retail restoration including a 20,000 square-foot Green Roof; and Edge Lofts, a Midrise residential project at 1405 Clinton Street which is a candidate to receive the first NJ LEED Residential for Homes Platinum designation. Beyond its individual properties, Bijou Properties is focused on creating better neighborhoods and healthier environments for the community at large. More information can be found on the company website: www.bijouproperties.com. The Marketing Directors is a development advisory and master property marketing and sales force that works exclusively on behalf of owners and builders of new homes. Headquartered in New York, with offices and sales teams active around North America, The Marketing Directors is known for its success in selling and leasing homes at prices that help its clients achieve their goals for each development. In its 30+ year history, The Marketing Directors has helped its clients successfully sell-out more than 1,000 new developments across the country – more than any other marketing firm. It is headed by founder Adrienne Albert and Jacqueline Urgo.